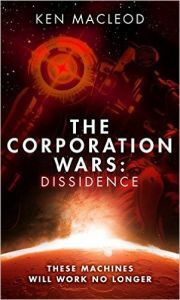 The first volume in Ken MacLeod’s new ‘Corporation Wars’ series, ‘Dissidence’, takes us straight into the action as we learn the back stories of the two main characters. Carlos is a reactionary/computer-hacker/terrorist in the midst of a war over London, controlling drones and weapons and swiftly meeting a violent end. Seba is a mining robot in a far distant star system who attains consciousness and quickly discovers that the powers that be are keen to quash any such self-awareness.